Humber North is serviced by Brampton Transit, Missisauga Transit, TTC, GO Transit and York Regional Transit. 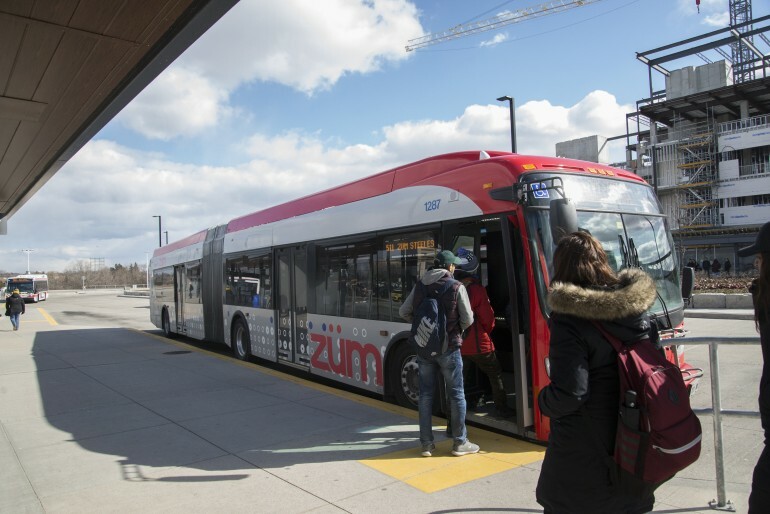 University of Toronto students rejected the U-Pass discount transit initiative after a majority of students at its downtown campus rejected it in a referendum last week. The idea of a Universal Pass, a TTC pass at a discounted rate of $70 a month, about 52 per cent less than current transit fares, had been a concept four post-secondary schools in Toronto were in talks with the transit authority to adopt. But for it to be worth the TTC’s effort, all four schools — U of T St. George, George Brown College, Ryerson University and OCAD — must be part of the program. The plan would give students a TTC pass at the discounted rate, but there’s a catch: commuter or not, every student has to pay for it through their fees, amounting to an extra $280 per semester. Students who don’t need the pass can’t opt out. The U-Pass plan died with the U of T students turning down the pass in the vote. Although a similar commuter discount was adopted at other universities and colleges throughout Ontario, it has been rejected by most of the post-secondary organizations in Toronto. “I think it seems unfair because not everyone would benefit out of having a TTC pass,” said Misbah Tariq, a first-year culinary student at Humber College. “We need to think about the international students that are going into debt staying on campus and paying higher fees. “This wouldn’t benefit a good majority of students,” she said. U-Commute was an initiative by the student unions of U of T, Ryerson, OCAD, and George Brown to help make commuting cheaper for students at their schools. A U-Commute survey taken August 2017 showed 95 per cent of the students polled support the idea. However, that support vanished as the referendum held last Wednesday resulted in a rejection by under-graduates. “This wouldn’t be the best idea for Humber College because we use many other transit systems that aren’t even TTC here and everyone basically drives,” Tariq said. Humber College was part of the initial consultations with the TTC, but the school government IGNITE opted not to take part. A Facebook page created by a few University of Toronto students before the vote to encourage students to vote no. The page stated.foreign students and those living in residence were angry that their views weren’t being taken into consideration. The matter is now back to where it started, a lot of commuting students and no better way to pay for the fees they face.